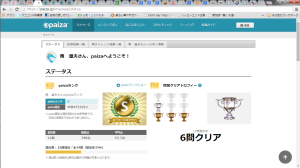 Today I got paiza Rank S! It says Rank S programmer ratio is only 2%. Is it really? I think tricks of solving paiza problems are two. If the code doesn’t pass almost all the problem’s test cases, it is difficult to get the rank of problem. It seems that coding to load input data by file and thinking various test patterns are important. 2. Review code until about 2 hours. Time penalty of the exam is nothing until 2 hours. So if the code passes its sample input data, it is better that review the code and testing more patterns for remain time.